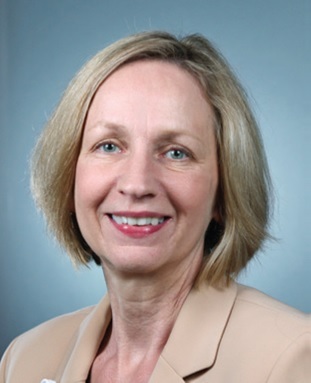 As Premier Health’s Chief Nursing Officer, Peggy Mark, RN, Ph.D., MBA oversees all nursing functions for Premier Health’s hospitals, ambulatory centers, and home care settings. "I work with a lot of great people to set policies, vision, and strategic direction for nursing, as well as ensure we maintain standards across the Premier Health system," says Mark. Premier Health is the largest healthcare employer in the Greater Dayton Area, employing about 14,000 people. A 2014 study published by Brookings reported that approximately 58% of healthcare providers in the Dayton Metro Area were pre-baccalaureate workers. "If you look at Premier Health employees—both in and out of nursing—we have so many people who have come from Sinclair. Sinclair is a great asset to our community and I don’t know what we would do without them and the graduates they send to us." Mark has been involved in the development of Sinclair’s new Health Sciences Center since she joined the strategic planning committee in 2014. One of the things I love about Sinclair’s strategy is that they are focusing on the future of healthcare," says Mark. "When developing the new Health Sciences Center, Sinclair looked at where healthcare is expected to be tomorrow and asked how they could design a building to meet those needs. The new Health Sciences Center was designed to foster inter-professional learning and features state-of-the-art classroom and laboratory spaces including simulation rooms and technologies for eight specialties including surgery, intensive care, and labor and delivery. "Designing the facility to allow for more inter-professional education opportunities will help train future healthcare providers to work together to care for patients," says Mark. "That inter-professional training, combined with the exposure students will receive in the simulation spaces, will help prepare students for the challenges and situations healthcare professionals encounter on a regular basis." The simulation spaces and other resources within Sinclair’s new Health Sciences Center will be available to community partners like Premier Health for continuing education and ongoing training purposes. "If we have needs for ongoing training, we can go to Sinclair and they are always willing to partner with us," says Mark. "They help ensure that future providers are educated to meet the needs of our community and also support our current professionals who need to update skills as the healthcare environment changes." "I just can’t say enough about what a great partner Sinclair has been and our partnership will only get stronger," says Mark. "I feel very confident with a partner like Sinclair that we’re going to be able to meet the needs of our community. As healthcare evolves, we’ll be able to evolve and train our healthcare providers." Sinclair College offers Health Sciences degree and certificate programs across fourteen areas of study.